Cycling's governing body the UCI found the 19-year-old's spare bike contained a motor at January's Cyclo-cross World Championships in Belgium. The result of the World Championship race, the women's under-23 race won by Great Britain's Evie Richards, is not affected. Scanning of bikes in UCI competitions has been introduced in recent years, but Van den Driessche's was the first found to contain a concealed motor. UCI regulations, which were recently strengthened, state that a rider is given a minimum suspension of six months and a fine of up to 200,000 Swiss francs (£141,000) for an offence of "technological fraud", while coaches, mechanics and other officials could also be sanctioned. Van den Driessche was competing during the women's under-23 race at the Cyclo-cross World Championships. The motor was hidden, along with a battery, in the tube below the saddle. It was controlled by a Bluetooth switch installed underneath the handlebar tape. "It was my friend's and was identical to mine. This friend went around the course Saturday before dropping off the bike in the truck. 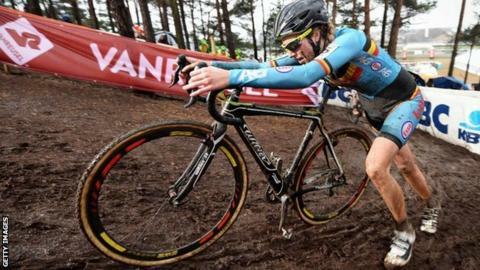 A mechanic, thinking it was my bike, cleaned it and prepared it for my race," she told Belgian television in January. Can you really 'dope' a bicycle? Read more on 'Doped bikes': Is this cycling's next cheating scandal?